Adorn your bed of choice with the elegantly designed Jessamine Headboard in Fabric. Designed with two rows of silver accented nail button trim, Jessamine comes finely upholstered in polyester, has a solid wood frame, adjustable black coated metal legs, and dense foam padding for ultimate support. Rejoice with a contemporary design that admirably compliments your bedroom decor. Fully Compatible with Sharon, Sherry and Helen Platform Bed Frames. ELEGANT STYLE - Luxury abounds in the stunning details and sophisticated design of Jessamine. 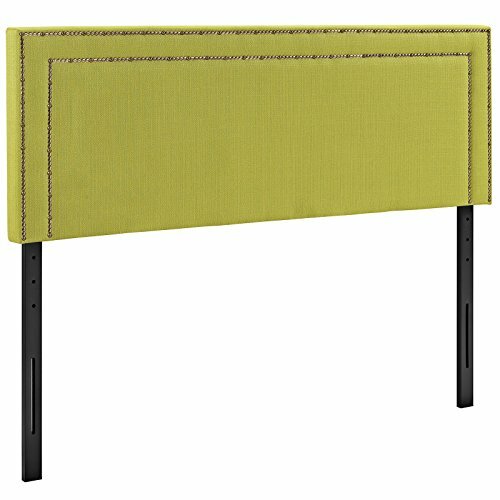 Modeling a blend of modern and traditional styles, this headboard is a truly timeless piece. FINE UPHOLSTERY - Upholstered in fine polyester fabric, this headboard boasts a neutral hue, adding a tranquil feel to a bedroom. The dense foam padding makes Jessamine ideal for supportive rest. SUPERIOR CONSTRUCTION - Built to last, this piece is constructed with solid wood and sits atop adjustable metal legs. This durable headboard features a particle board panel for stability. CHIC DETAIL - Emanating style, Jessamine showcases sleek lines and is delicately adorned with two rows of dazzling nailhead trim that lends itself to a chic, subtle framed appearance. MOUNTING POSITIONS - Location A: 47.75" (Height To Bottom Of Headboard) to 70.25" (Height To Top Of Headboard) Location B: 45.25" to 67.75" Location C: 42.75" to 65.25" Location D: 40.25" to 62.75"